COLUMNA MESSIANIC RESEARCH CENTER: Leadership & Governance 3: WHY IS THERE VERY FEW OR NO GREAT MESSIANIC LEADERS IN THE WORLD TODAY? Because When People Sin, God Removes Messianic Leaders And Replace Them With Unstable Humanistic Youth And Women Leaders! Leadership & Governance 3: WHY IS THERE VERY FEW OR NO GREAT MESSIANIC LEADERS IN THE WORLD TODAY? Because When People Sin, God Removes Messianic Leaders And Replace Them With Unstable Humanistic Youth And Women Leaders! 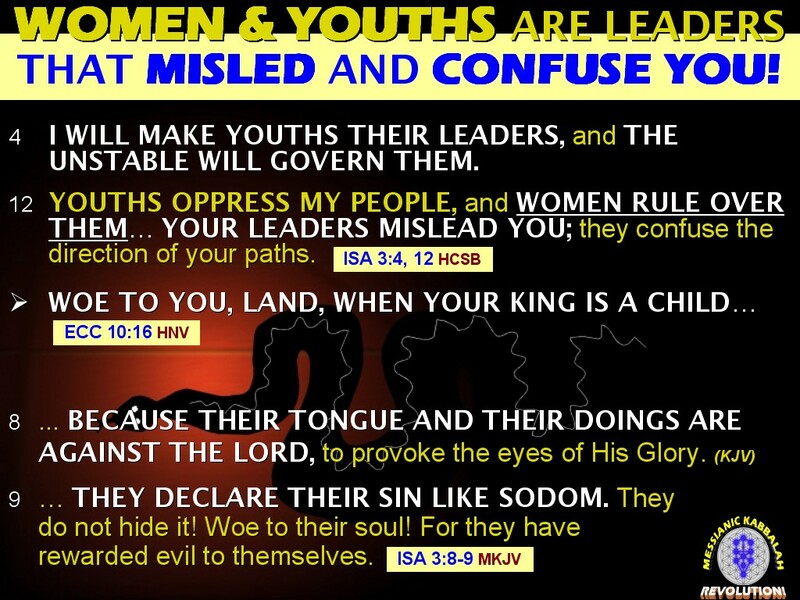 Because of the many sins and open rebellion of society to God's Laws and Commandments, God removed their righteous leaders and replaced them with the unstable youths and women that mislead them! Thus, instead of their Leaders serving them, it is now the people who are serving their Leaders. And oftentimes, the people are oppressed by their blind humanistic Leaders whose goal is for the relentless search for their own selfish pleasures, wealth, and power. This is the reason why there are lots of corruption and ill-gotten wealth committed by almost all Government officials today! And the whole world is in grave dangers, and is in the threat of human extinction. Because of man's sins and rebellion against Him, GOD removed the righteous leaders in Religion, Education, Politics, Military, Business, Science, and Technology (Isaiah 3:1-3). WHY GOD REMOVE MESSIANIC LEADERSHIP AND REPLACED IT WITH HUMANISTIC LEADERSHIP? The lack of Messianic Leadership creates a powerful vacuum that gives way to the Humanistic Leadership that misleads and destroys People, Churches, Religions, and Nations! AND GOD GIVES PEOPLE WOMEN AND YOUTH LEADERS WHO MISLED AND CONFUSE THEM; AS THEY DESERVED IT! So, instead of their Leaders serving them, the people are now the victims, and the oppressed servants of these blind and selfish leaders whose goal is for the relentless search for their own pleasures, wealth, and power. So, the world today is governed by humanistic leaders, not Messianic leaders! This is the reason why the world today is in grave dangers, and is in the threat of human extinction. Continued on Part 4 > The UNIVERSAL LAW OF THE ROSH (HEAD)! This is the Proper Flow of Authority, Energy, and Blessings in Marriage, Family, the Government, and the Universe! If Not Applied, You Are Guaranteed to Failure, Destruction, and Death!